The indigenous communities of Nepal have been doing honey hunting in Nepal for a long time now. That is how they earn their bread and butter. This family job of honey hunting is still continuing in many remote villages in Nepal and one of the main occupations of Gurung and Magar communities in the Bhujung region. Honey Hunting is the collection of Honey from the nests of wild Bees built on steep cliffs which is an age-old tradition. 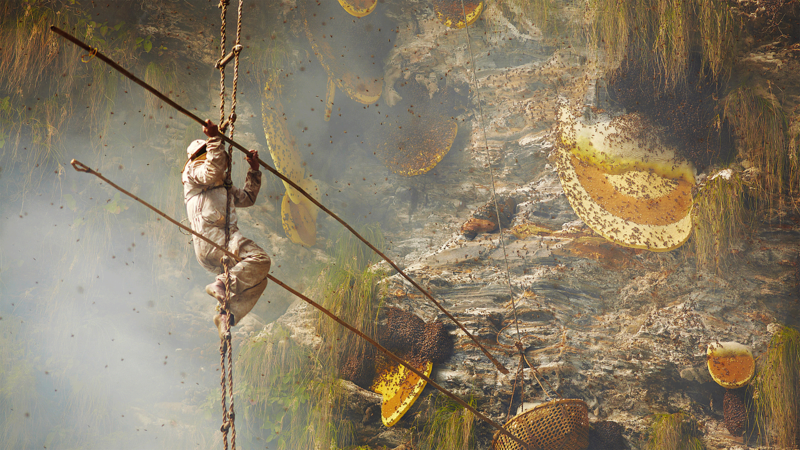 Local honey hunters show their exceptional skills by hanging themselves from cliffs as high as 300 meters using Bamboo ladders and hemp ropes, while harvesting the honeycombs. Everyone is thrilled to watch honey hunters at work. Honey hunting has been an amusement to many, especially to tourists from around the world, as the packages for honey hunting usually also combines trekking to some regions great for trekking purposes. The appealing fact about Honey Hunting in Nepal is the worship part by the indigenous group previous to hunt by dancing and offering food items to the nature. In general the Hunting Honey is carried out 2 times in a year. Best month for honey hunting in Nepal in the spring and autumn. A large section of travelers are increasingly showing their interest in honey hunting thereby ensuring stable sources of local revenue generation through this, besides Ghalegoan, Bhujung and the whole of Annapurna region, Dhading and Jharlang across Ganesh Himal Arun valley in Makalu and other trekking areas have become quite popular for honey hunting, a new tourist activity in Nepal except Bhujung area of Annapurna region. Special package of Honey hunting for tourist is not developed yet. Nevertheless few lucky travelers get an actual chance to observe honey hunting on spot while traveling along the trekking routes. This is a camping Trek including Honey Hunting. There are several trips offered that give you well experience at Honey Hunters to do the Job, you will enjoy the trip throughout.